We are all in an autumn frame of mind this time, and this little gem of a stamp set certainly fits the bill! 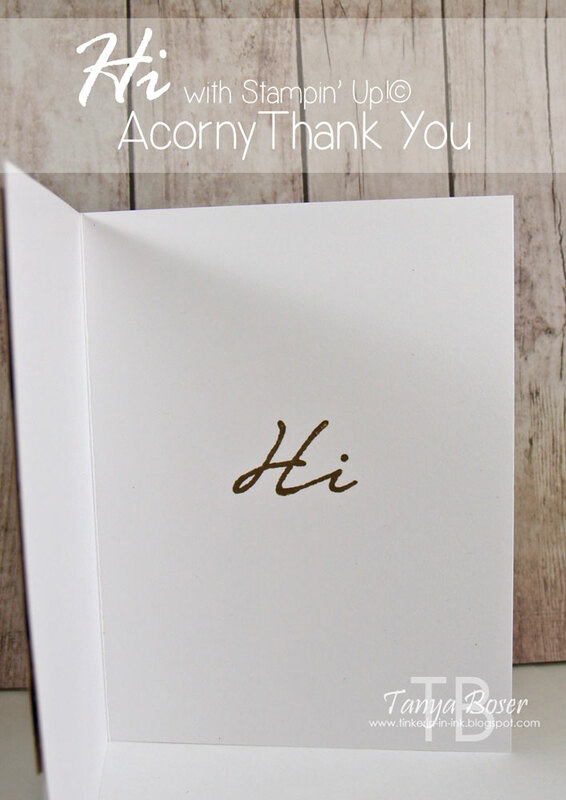 Acorny Thank You came out last year, I believe, and it has a coordinating punch :) I love that there are different patterns of caps and shells. And I adore the sentiments in this set! 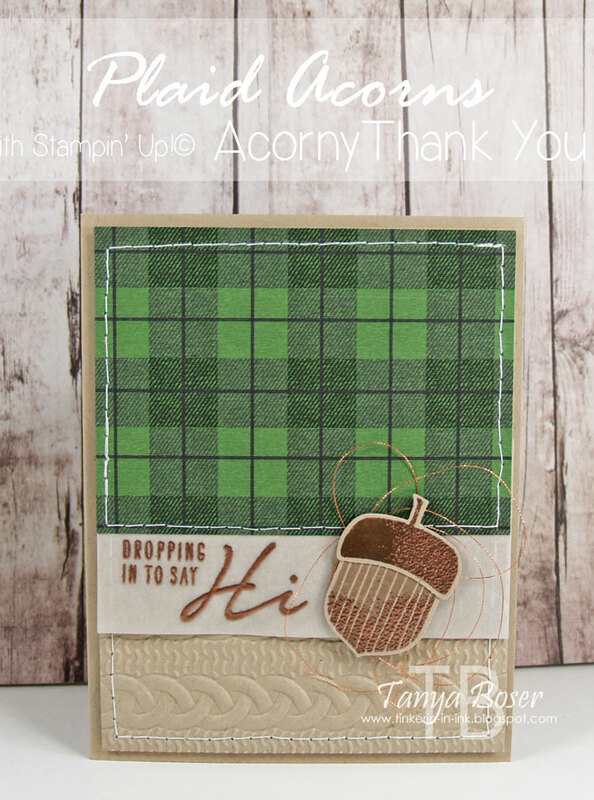 If you are following along in order, then you just arrived from Dawn Tidd's blog where she amazed you with her creativity! Fair warning, I got a little carried away with this set. I created all of these cards in about 2.5 hours! 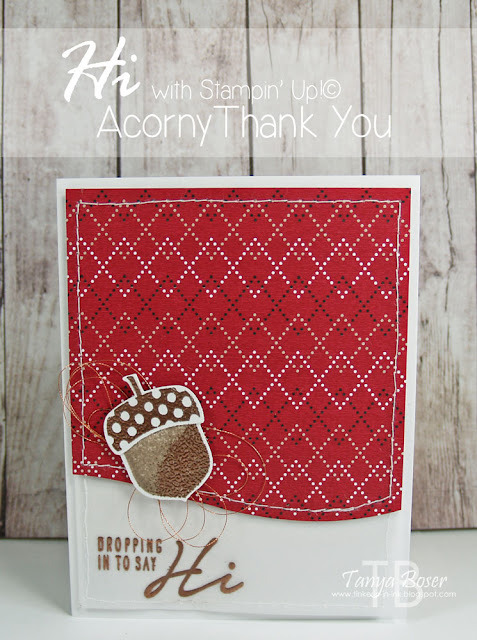 First up is this warm and cozy, clearly autumn themed card. I had visions of the plaids and prints from Warmth & Cheer DSP stack combined with the Cable Knit embossing folder and these acorns falling down the card. The sentiment is Copper embossed on a strip of vellum I adhered under the DSP. Inside I stamped the acorn components 3 times each without reinking. The shell is stamped in Soft Suede and the cap in Early Espresso. I did breath on the stamp for the 2nd and 3rd impressions. How about a close up of all the texture and detail. If you don't have the copper embossing powder yet, I would order it soon as it is in short supply. I also think the Cable Knit embossing folder is a must have! Next up I made a very similar card with the reverse side of the DSP. I had cut the 6"x6" DSP piece into two 3"x4" pieces and used one on each card. 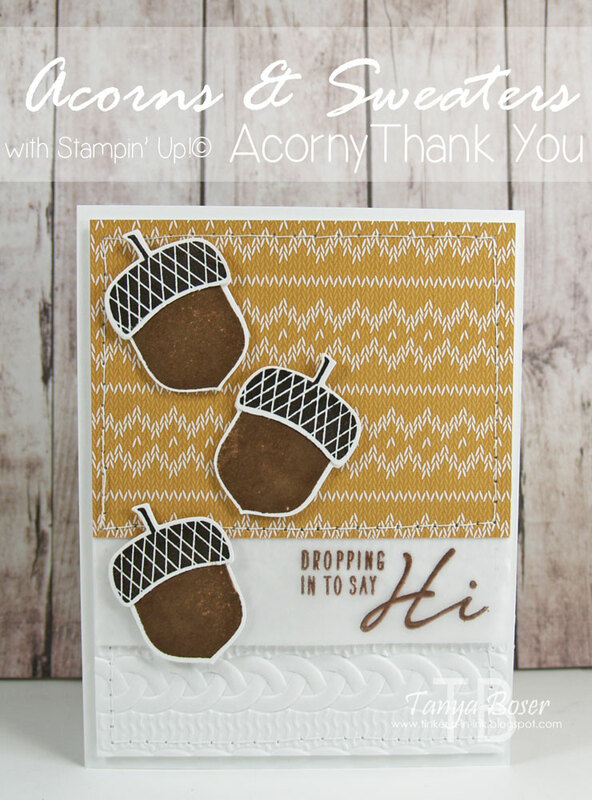 The twist on this one is that I switched up the images for the acorn parts, and after I stamped them, I sprinkled some Copper embossing powder on parts of the images. And I added a nest of Copper thread behind the acorn. I love that the ink was still wet enough for the embossing powder to stick and give this speckly, distressed, gilded look. 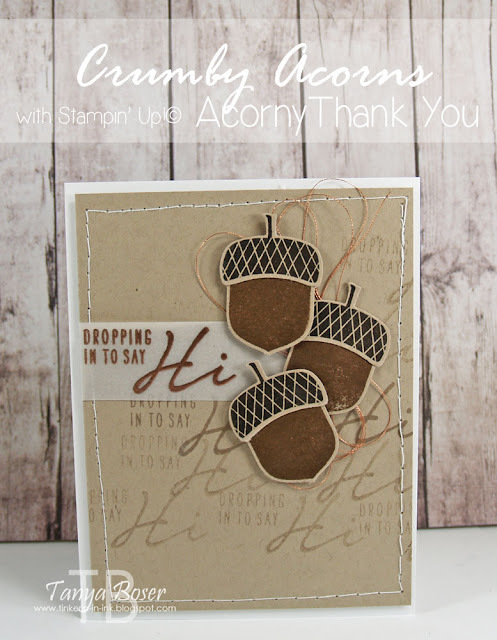 Then I wanted to try stamping the sentiment repeatedly as a background. So I did, in Crumb Cake ink on Crumb Cake cardstock. The acorns are stamped in Soft Suede and Early Espresso on Crumb Cake. The inside got a single stamped-off acorn that is light enough that it can be written right over. I think I like the gilded acorn on this card the most. For this moment anyway, lol! The cap was stamped in Versamark and embossed with Copper embossing powder. 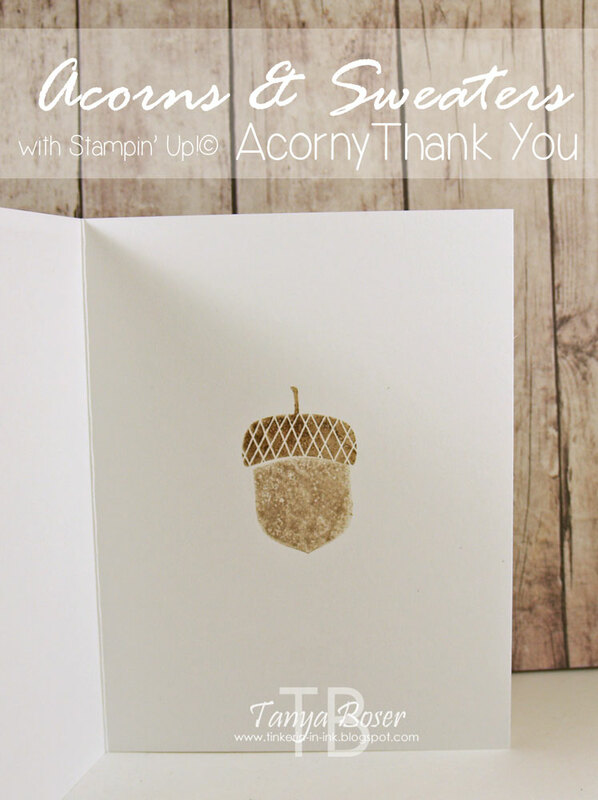 And the shell is stamped in Crumb Cake, then sprinkled on one side with the Copper embossing powder and heat embossed. I created the swooped edge with the wavy swirl die. So easy! And yes, I cut my stamp apart :) I love this "Hi" and wanted just that for the inside of this card. Then I really wanted to make a slider card. This was so easy using the Sliding Star framelits to create the track for this slider, and the Foam Strips to raise it up. So slick!! And I changed it up a little bit and used Gold embossing powder instead of Copper :) I also used some sentiments from Thoughtful Banners, and since they are photo-polymer I was able to curve them just a bit to fit in the slider window. I had created the flannel panel first, then traced the window onto the cardbase to get the placement right. Here is the slider in action! 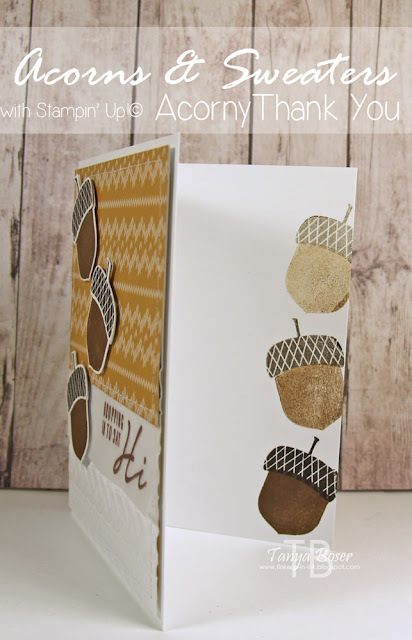 I have actually featured this stamp set in a blog hop before, just not for the Stamp Review Crew. You can find that post here. 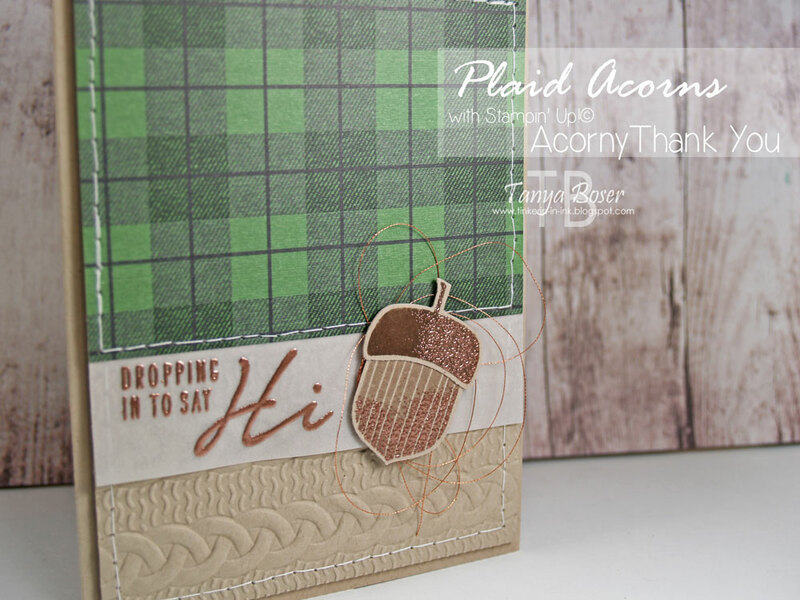 OK, that is finally the end of my creations for this hop, and it is time to go see what Sue Plote has created. She is so talented!